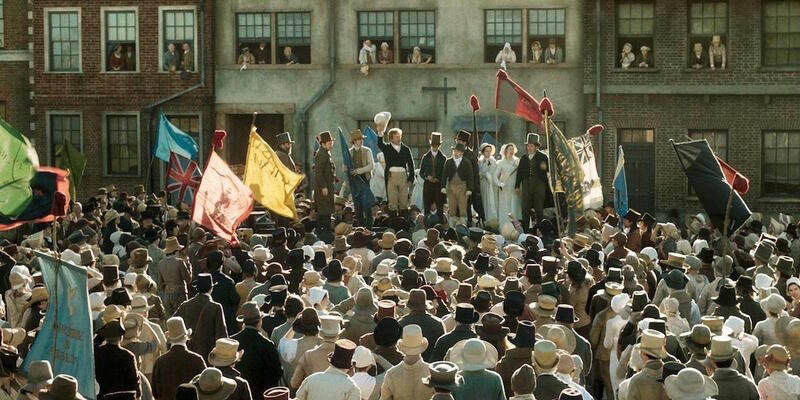 Mike Leigh, Peterloo, 2018, DCP, color, sound, 154 minutes. TO DESCRIBE A FILM AS “TALKY” IS, as often as not, to indicate a pejorative judgement; in a thousand screenwriting primers, you can read the adage “show don’t tell”—like any rule in art, to be discarded at will when circumstances demand. Mike Leigh never read any of those books, thank God, and though you could dismiss his latest, the oratory-laden Peterloo, as talky, to do so would be to fundamentally misunderstand the nature of his project, which is precisely concerned with the relationship between speech and action, the butterfly effect principle whereby words spoken in, say, the House of Commons down in London, can result a few years later in dead bodies in St. Peter’s Square, Manchester. Carl von Clausewitz, a Prussian general celebrated in his day for his battlefield actions in the Napoleonic Wars but today best remembered for his aphorisms, famously described war as “the continuation of diplomacy by other means”—in other words, what happens when the talk fails. And indeed the palaver that makes up Peterloo is sandwiched between two moments where articulated speech has given way to cries of agony—it begins in the heat of one bloody military rout, the field at Waterloo where Napoleon’s ambitions went to die in 1815, and ends in the aftermath of another, the 1819 Peterloo Massacre in Manchester, in the course of which English cavalry set upon unarmed Englishmen and women with sabers drawn. Linking these two events is the figure of Joseph (David Moorst), a young, unarmed trumpeter first encountered on the battlefield staring out dazed at the carnage around him, managing to quaveringly sound his horn through muscle memory alone—the character is perhaps based on John Lees, a Waterloo veteran, and one of Peterloo’s dead. It’s a more harrowing, up-close version of the clumsy Waterloo of Stendhal’s The Charterhouse of Parma, all mud and thunder and confusion, no glory. Joseph returns shell-shocked to his family home in Manchester, and never thereafter will he recover to be the boy that he was, remaining instead haunted, folded in on himself, and affected by a hard, compulsive blink that seems like an attempt to flush the inescapable image of horrors from his eyes. While Joseph looks in vain for a job, wearing an increasingly soiled and tattered uniform, his father works in one of the local textile factories, introduced in a startling smash cut that shows scores of looms chugging together in thundering unison, a mill in England’s industrial north not unlike those owned by the father of Friedrich Engels, who would write of the misery he found among Manchester’s laborers in his 1845 The Condition of the Working Class in England. In these times, however, the call isn’t for global revolution, but for parliamentary reform and the expansion of suffrage, a cry growing louder and louder in the north, identified early on by Lord Sidmouth, the Home Secretary (Karl Johnson), as a hotbed of insurrection; the smoke of the American and French Revolutions is still in the air, and the English ruling classes are cagey. As Joseph’s family feels the pinch of economic hard times, including an increase in the price of bread, the men take to frequenting taverns where local reformers speak. Joseph’s father (Pearce Quigley) sees sense to some of what’s being said; it’s impossible to say if Joseph, from the depths of his PTSD, even grasps the substance of the discussion. As for Joseph’s mother (Maxine Peake), she can see nothing but trouble in this “Talk, talk, talk”—just one of the expressions of distrust toward language that run through the film like a leitmotif. 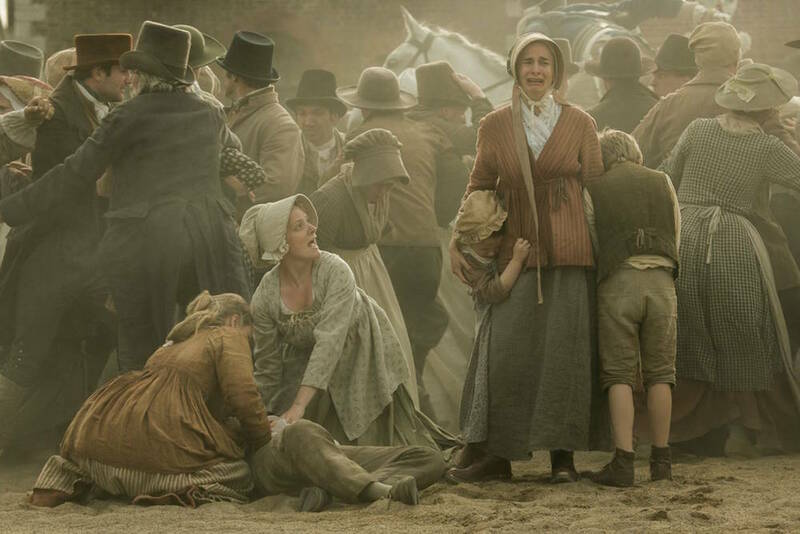 Mike Leigh, Peterloo, 2018, DCP, color, sound, 154 minutes. Rory Kinnear as Henry Hunt. Talk is the lifeblood of these characters, and they are revealed through their discourse. This comes often in the form of political rallies, though we also see more intimate exchanges, either private rehearsals of written public declamations or Joseph’s mother haggling over the price of eggs at market as she struggles to stretch the family purse. It is hard to think of a contemporary filmmaker more dedicated than Leigh to examining different patterns of speech—different conversational cadences, accents, and vocabularies, with their telltale markers of about the background of the speaker, and their place in the British society that is Leigh’s subject. In his filmography one finds characters capable of verbal pyrotechnics, like David Thewlis’s Johnny in Naked (1993), who wields his tweaky, motormouthed erudition like a weapon, and can’t speak a commonplace phrase to save his life. (“Are you aware of the effect...you have on the average mammalian, Mancunian...X-Y’ly chromosome, slavering...lusty male member of the species?”) There is likewise a whole gallery of the tongue-tied, the inarticulate, and the closed-off: Stammerers Anne Raitt and Eric Allen in Leigh’s debut, Bleak Moments (1971); Tim Roth’s morbidly shy Colin in Meantime (1983); the grumbling, muttering working-class genius J.M.W. in Mr. Turner (2014). In the din of talk that makes up Peterloo, one hears something of everything—the terse speech of the Lancashire peasantry, strewn with “nowts” (for “nothings”) and “summats” (for “somethings”); a broad spectrum of soapbox speechifying, much of which shares its basic DNA with the messianic language of the pulpit; and that particularly English brand of parliamentary bloviation that will be familiar to regular viewers of Prime Minister’s Questions. As the film proceeds, grandiloquent phrases are tossed about freely: “The pimps of authority,” “The creeping cholera of revolution,” and much more besides. Content often doesn’t vary vastly from speech to speech, but most everything else does, in subtle registers. Leigh is of course interested in the substance of all of this chatter, but he’s an artist rather than a propagandist, and he’s after something other than dinning Regency era-vintage radicalism into twenty-first century viewers—he’s tracking the way in which ideas travel a crowded room, landing differently from listener to listener, the relation of thought and deed, and exploring the very texture of talk. His film is a veritable catalog of elocutionary tics: the way Ian Mercer’s Dr. Joseph Healey rolls his tongue in his mouth with delectation after every utterance; the tremor that afflicts Karl Johnson’s Sidmouth, something like the aftereffects of a stroke, the plummy deliverance of Tim McInnerny’s dandyish Prince Regent, ruling in lieu of the indisposed George III, who speaks as though he has a bonbon permanently wedged in his throat. One final speech ends Leigh’s film, a priest’s words over a fresh grave, with Joseph’s family, the backbone of the story, gathered around. The prayer is only noise, for the survivors are beyond hearing. As the Gettysburg Address, a literary accomplishment, articulates the inadequacy of eulogy for the departed, Peterloo expresses this inadequacy in agonized close-up, a moment that is singularly cinematic—you might say it shows, doesn’t tell. This most talky film ends where it must, registering faces eloquent of an anguish far beyond any expression. There is nothing left to say. 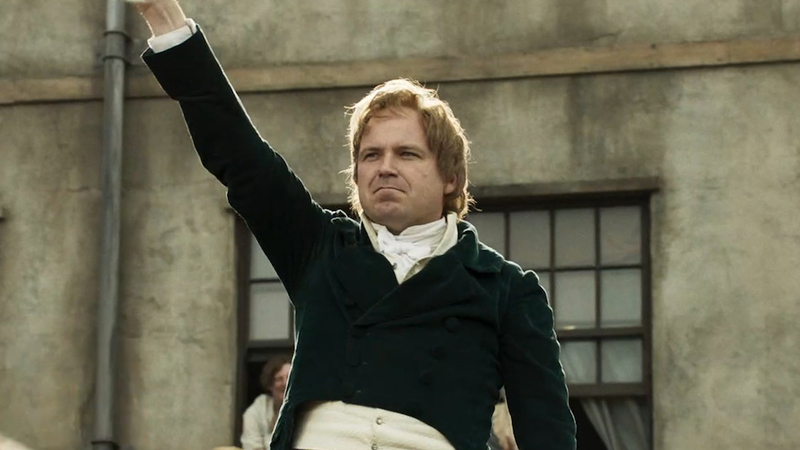 Peterloo opens in US theaters on April 5.